The Service Delivery Point (SDP) Dashboard Module of the Directorate General of Family Planning’s (DGFP) electronic Logistics Management Information System (eLMIS; https://scmpbd.org/index.php/lmis-dashboard) was formally launched on November 30, 2016, at the Hotel Pan Pacific Sonargaon, Dhaka (the system was rolled out and has been used since June 2015). The Honorable Minister Mohammad Nasim, Member of Parliament, Ministry of Health and Family Welfare (MOHFW) digitally inaugurated the module in front of 200 participants including senior officials from the MOHFW, DGFP, Directorate General of Health Services (DGHS), USAID, other international and national organizations, and media representatives. The event was organized by DGFP and facilitated by the USAID-funded Systems for Improved Access to Pharmaceuticals and Services (SIAPS) Program (implemented by Management Sciences for Health). A technical presentation and a live demonstration of the system were made by two DGFP deputy directors to show how the dashboard module works, which reports and data are available, and what decisions could be made. Two DGFP field officials shared their experiences with the audience, focusing on how the system has reduced their workload, enhanced efficiency, and helped ensure product availability. A video on the frontline users of the SDP dashboard, made by SIAPS, was also shown during the event. SIAPS hosted a display booth that served as an avenue for informing participants about the work SIAPS Bangladesh does. The Honorable Minister Mohammad Nasim (middle of the table), MOHFW, presents an award to the Deputy Director of Family Planning, Mohammad Saiful Islam, for avoiding SDP-level stock-outs of all contraceptive methods from April to October 2016. In a speech, special guest Prof. Abul Kalam Azad, Director General, DGHS, acknowledged SIAPS as one of the trusted partners in Bangladesh. He thanked SIAPS for replicating and rolling out a similar system in DGHS to reduce stock-outs of 25 essential commodities for maternal, newborn, and child health, up to the community clinic level. MOHFW Secretary Md. Sirazul Islam appreciated the eLMIS system as an important tool and representative from USAID Bangladesh Brenda Doe stressed the sustainability of such a system that helps bring about better health outcomes. 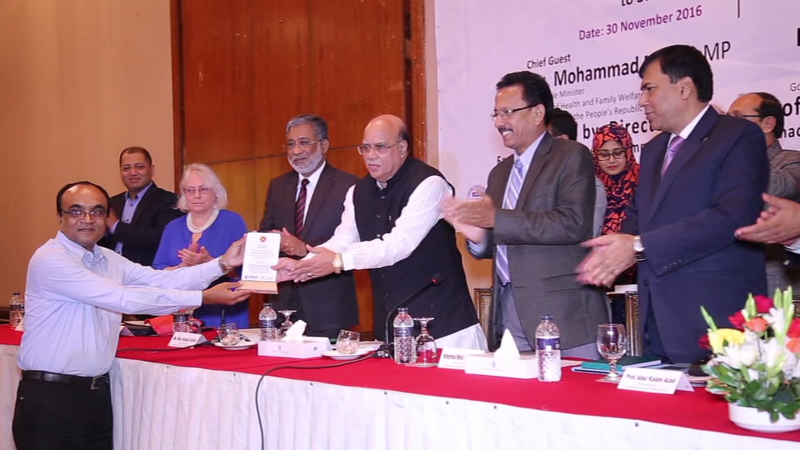 As the chief guest, Minister Mohammed Nasim gave an award to the Meherpur District for remaining “free from stock-out” of any contraceptive items at all levels of service delivery for the six months between April and October 2016. He hoped that DGFP will effectively use the system to keep stock always available. SIAPS Bangladesh Country Project Director Zahedul Islam congratulated DGFP for their effective leadership in using the eLMIS to keep the stock-out rate of family planning commodities below 2% (https://scmpbd.org/index.php/sdp-report/stock-out-of-any-method) and mentioned that SIAPS is now in the process of transitioning the system over to DGFP. During the event, Director General of DGFP Mohammad Wahid Hossain thanked SIAPS and USAID for their technical assistance toward system strengthening and capacity building of DGFP. With the SDP dashboard module, the DGFP is tracking the stock situation for contraceptives and other essential family planning commodities, from the national warehouse level to over 29,000 SDPs. As SIAPS will be phasing out soon in Bangladesh, this event provided a great opportunity to motivate DGFP and MOHFW to continue using the systems effectively and making data-driven decisions to save the lives of women and children.